Our most popular tour takes you along a portion of the historic Hermit Road route. The road, originally built by early pioneers and then improved by the Santa Fe Railroad, winds along the Canyon’s rim for 7 miles and is closed to public vehicle traffic. 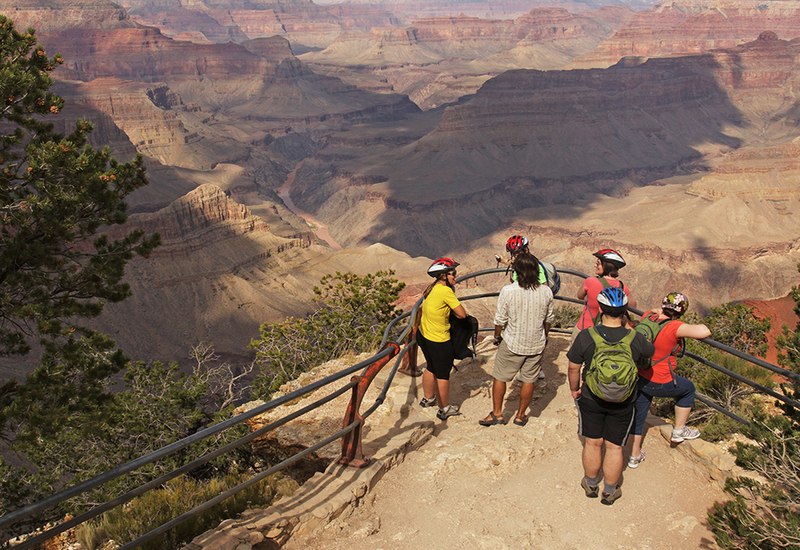 It boasts some of the grandest views along the South Rim. This is the best scenic bike ride to do in the West!! Not to mention the safest for families wanting to explore the rim by bike. 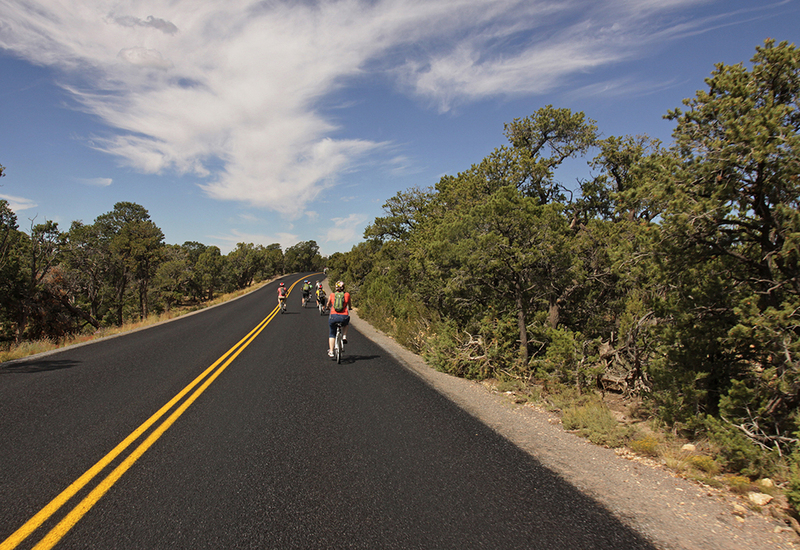 After boarding the van with our bikes in tow, we bypass the challenging uphill section of the road to begin riding at Hopi Point. Named after native peoples in the area, this Point offers one of the most sweeping vistas of the canyon available on the South Rim. From there the tour proceeds westward for 5.5 miles (9 km) of low intensity riding; stopping at jaw-dropping lookouts along the way to take in the sights and hear interesting information about the natural and human history of the area. The tour ends at Hermit’s Rest where you can take your picture with the historic bell that graces the entrance to the 1914 Mary Jane Colter building. The structure was designed to provide shelter, food, and curios for tourists at the end of the West Rim Drive in the early tourism days at Grand Canyon. From Hermit’s rest our van will return you and your bikes to our location at the Visitor Center. This is a fantastic tour for everyone including families with children! 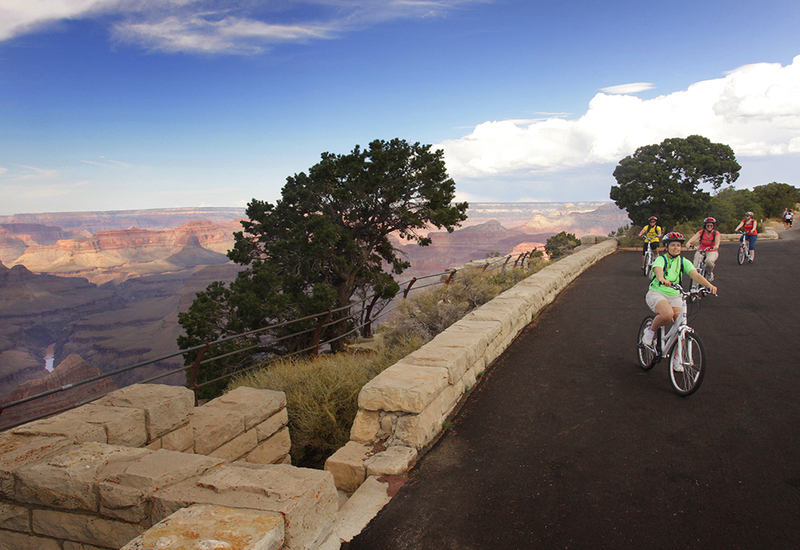 About the Company: Bright Angel Bicycles is Grand Canyon’s first “in-park” bike rental facility. Bright Angel Bicycles is committed to providing excellence in service and operating ... morea environmentally and socially responsible business. Bright Angel Bicycles is located next door to the Grand Canyon Visitor Center at the South Rim of the Grand Canyon in Grand Canyon National Park.